Home / Scents / Amphora Aromatics - Festive Fragrance Range. Amphora Aromatics - Festive Fragrance Range. Mood setting grounding and soothing. thanks to this traditional christmas fragrance combining rich musky warmth with a vanilla-citrus edge. Uplifting And Inviting, a classic sweet and spicy combo to get you in the mood for christmas. Warming And Welcoming, the sweet and fruity hints of almond, vanilla and citrus make you feel at home for christmas. Inviting christmas into your home with this luxury fresh and fragrant festive ambience. Stimulating, Comforting And Warming, helping to soothe any over-active digestive system. Gold Frankincense & Myrrh Incense. 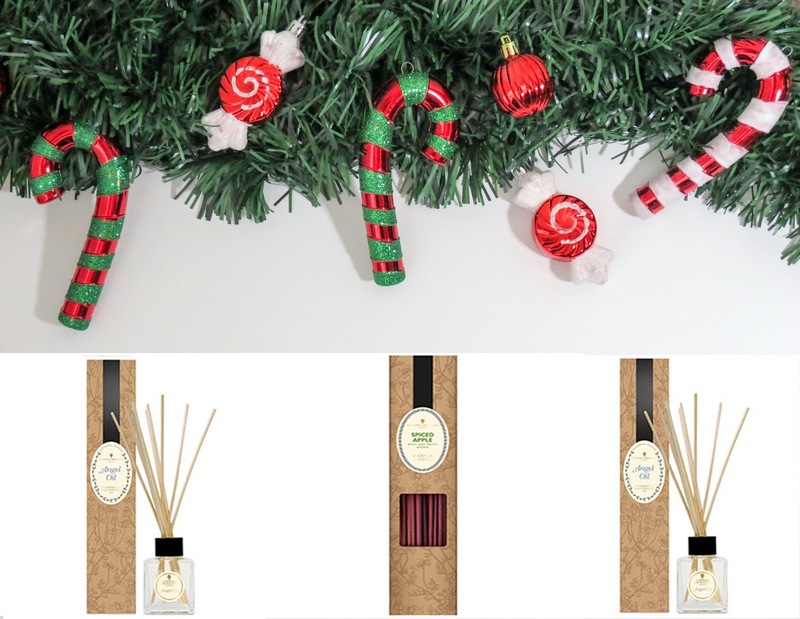 Relieve Tension And Stay Calm, A traditional christmas fragrance to be enjoyed by these non-toxic incense sticks. Create a festive mood in any setting with this 100% essential oil blend containing fruity orange, exotic cinnamon and spicy clove. Comforting, Restorative, and can help boost Energy levels. 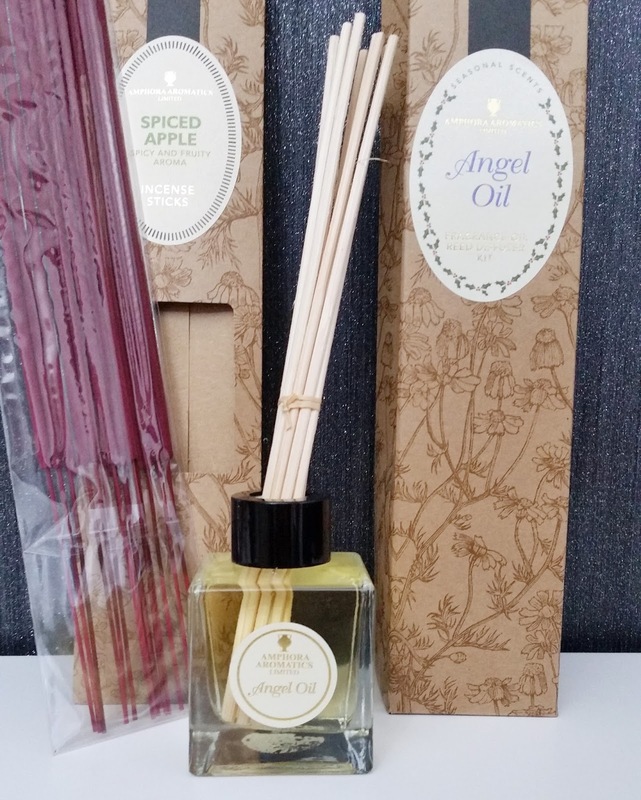 Amphora Aromatics sent me the Angle Oil from their festive fragrance range along with the Spiced Apple incense sticks. The fragrance oil reed diffuser kit arrives in luxury packaging along with clear directions printed on the back. The rattan reed diffuser box kit contains high quality aromatic oil in a natural vegetable derived, alcohol and glycol free fluid along with 10 reeds and a glass container. Unscrewing the lid and removing the cork, your senses will be overcome from the fresh and fragrant christmas scent it omits. Screwing the lid back on and placing the reeds in the hole available you can then place this in your room to enjoy the festive aroma. Amphora Incense can help you relax, concentrate or create an environment meditation. The non-toxic incense sticks are made with bamboo tree pulp from sustainable sources. Creating a more intense aroma anywhere u would like, each sleeve contains 15 incense sticks. Placing in a secure burner, light the incense coated end and gently allow to burn for 30 seconds. When the end is glowing extinguish the flame and enjoy the aroma, each stick burns for 1 hour. Amphora Aromatics collection of luxury aromas are included in candles, incense sticks, diffusers as well as tools to burn or vaporise your chosen pure essential oil and absolute oil. see more of the festive fragrance range to buy as a perfect Christmas gift for someone or as a treat for yourself. X Neil.